Asus is quick to point out that it is the leader in gaming laptop sales with a 29 percent share of the market, according to data by market research firms GfK and the NPD Group. Whether it can retain pole position in 2017 remains to be seen, but if not, it won't be from a lack of new laptops. The company today announced several new gaming notebooks, all refreshed with 7th generation Intel Core processors (Kaby Lake). There are more than half a dozen new Kaby Lake laptops in Asus' stable. Sitting at the top is its ROG GX800VH, a massive 18-inch system powered by an overclockable Core i7-7820HK processor and two GeForce GTX 1080 GPUs in SLI. 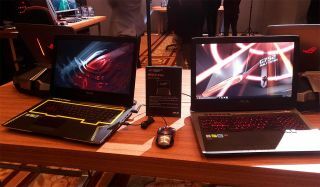 The ROG GX800VH is also unique in that it is liquid cooled using the Hydro Overclocking System, an external dock that connects to select Asus laptops using a patented connector. Inside the dock are liquid cooling components, including radiators, tubing, and a pump. Sitting just below the ROG GX800VH is the ROG G701VI. It also sports a Core i7-7820HK processor, along with up to 64GB of DDR4 memory now clocked at 2800MHz (the previous generation used DDR4-2400MHz RAM), GeForce GTX 1080 GPU, two M.2 PCIe x4 NVMe SSDs, and a 17.3-inch Full HD display with a 120Hz refresh rate and Nvidia G-Sync support. There is also a 4K IPS option. Another 17.3-inch laptop that is getting dipped in Kaby Lake is the ROG 752VS. This one is powered by a Core i7-7700HQ processor, up to 64GB of DDR4-2400 RAM, and a GeForce GTX 1070 GPU. Like the G701VI, the ROG 752VS sports a Full HD panel with G-Sync and a 120Hz refresh rate, which can also be upgraded to a 4K display. Finally, Asus refreshed its ROG Strix laptops, including its GL502, GL702, GL553, and GL753 offerings. While no pricing information has been shared yet, these will be less expensive offerings with more pedestrian (though still fast) parts such as Core i5-7300HQ and Core i7-7700HQ processor options and GPUs from the GTX 1050 on up. Asus brought quite a bit of gear to CES this year, including new motherboards, peripherals, and other items. We took some pics of what it had on display—be sure to check them out!